As a composer he works on a varied rhythmic dimension and develops a melodic discourse of broad lyricism. He uses a personal system of composition based on symmetric, so-called ‘reflecting’ modes. He has composed for solo instrument: Cercles réfléchissants for large organ (2008), Trois solos for organ (first performed in Dresden Cathedral by Frédéric Champion in 2011); for chamber ensemble: Reflected faces for string quartet, flute, harp and clarinet in B flat (2006), Citadelle for piano and cello (premiered by François Chaplin and Xavier Philipps in 2015), Sur un sommet for wind trio (2016); and also for larger groupings: Émergences for children’s chorus and large organ (commissioned by Radio France, 2005), Distances for orchestra (first performed by the Ensemble Intercontemporain in 2010), Crop circles for large orchestra (commissioned by Radio France and first performed by the Orchestre National de France in 2012), Les chants de l’âme for trumpet and string orchestra (premiered by Romain Leleu and the Orchestre d'Auvergne in 2014). 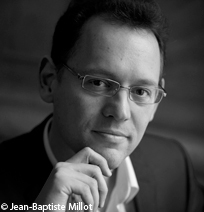 A teacher of organ and of harmony and counterpoint at the Versailles Conservatory, Jean-Baptiste Robin is also co-titular organist of the Chapelle Royale of the Château de Versailles.